It was hot. It was hard. But in the end, it was worth it! 33 employees and friends got together one sunny morning (Feb 27) to travel far south to the famed dive site of Batangas. But we did not have tanks or skins in tow. Rather, we had our backpacks, cooking pots, burners, and trekking shoes. We were equipt to summit the beautiful Mt. Gulugod Baboy. The waters of Batangas can wait. The walk up to the jump-off was a grueling hour of paved roads, inclined to about 70 degrees at times. But once the real trek started, we were hiking under the canopy of branches and leaves. Once in a while, we would be greeting by increasingly beautiful views of the seas fronting the mountain. A few hours after, (in slow motion) we reached the summit. It was tree-less but breath-taking! We spent a good few hours running around and having pictorial sessions. The view was just spectacular! That night, the moon shown brightly overhead. The festivities were underway, with a few "kilig" moments courtesy of the cuties at the other camp. The next morning, a little fog greeted us as we woke up to the sweet and cold scent of freshness. We went down to the beach resort where we came from and had a quick dip. It was short, but truly sweet as we got back to Manila a little after 4 in the afternoon! One hiker commented after the hike, "may igaganda pa pala!" Yes, the hikes and activities just get better and better! So many people are getting into the sport of running and it is just but fit because running is a great weay to stay fit and have fun. With this, SPiMC decided to engage in another super activity by mixing our love for hiking with our want to start running. Thus, KM72 adventure race was born. It was a great November morning when 5 pairs of challengers converged at KM O in Luneta for the start of the race. 10 adventure seekers, 7 great activity stations, but only 1 team can emerge as the winner. After a windy flight of the kites in Luneta, challengers went to CCP to seek for an elusive spot. From there they took adventure rides to a Pasay bus station where they picked up school supplies for their next activity. From the station they took a relaxing bus ride going to KM72 where they engaged in a game of wits to figure out key words so they can move to the next station. Along the way up, they were asked to make a decision that could get them up the top of the race. One team made it all the way up with the fastest time. They weren't always at the top but their strategies got them to the top. All the challengers made it to the top. That alone is an accomplishment! At the camp site, the rest of the hikers welcomed them with cheers! They made it to the top. Some wanted to stop along the way but their will power got the best of the them. The best indeed! That evening, the president of the club thanked everyone for joining the activity that was made in celebration of the 10th year anniversary of the club. 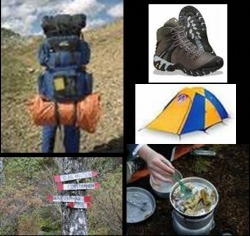 Mountaineering materials and equipment were raffled off and everyone went to socials with at least one new item in tow. The rest of the night was filled with merry-making that caused some to oversleep. No hard done since we were not in any hurry to end the activity. We were invited by the Yabag Group to join them in Nagsasa in September but we had a climb then. After their adventure, they shared the pictures with us. We were amazed at the beauty and promised ourselves that we would also visit that site. A month later, we were at the jump-off in the middle of the night. This is the story of Mt. Nagsasa and Nagsasa Cove and how beautiful the adventure was. Friday night, we all trooped to Victory Liner and hopped on our rented bus for Olonggapo. 3 hours later, we were at our favorite Zambales waiting spot, Chowking, for a very early breakfast (2am). The jeep then arrived and brought us to the jump-off. We immediately wore our headlamps and walked towards the mountain. We all thought the real jump-off was a few minutes away until we noticed that there did not seem to be any plan to stop walking. The initial walk was long but since we started long before sunrise, the cool air helped to make the walk relaxing. The trail was not steep but it was long. We were expecting a 5-hour climb but were hoping for something short. It took some of us as little as 5 hours to get to the cove, while a majority took longer. Once we reached the saddle of Mt. Nagsasa, our eyes suddenly turned to see one of the most beautiful beaches ever. We could see the blue waters of the beach and the white sands of the shore. It gave us a super boost of energy. The only daunting thing was the realization that between the saddle and the shore was a long, long, looooong path. At the beginning of the last leg of the climb, we went down a steep path. After which, the path was easy. The trail ran through rocks, rivers, streams, soft sand, hard sand, cogon, and more sand. A few hours later, we could already see the shore. It was a sight to behold. It was a place like those in post cards and coffee table books. It was clean, barely inhabited, quiet, and dreamlike. All the efforts spent trying hard to get to the beach were worth it. Everything was worth it! Clear skies, blue waters, white sand, sweet scent of the mountain breeze, they all relaxed our weary bodies. It was after lunch when the last group reached the cove. Lunch was already set for them. Our guides ate lunch with us. They were very helpful in bringing our heavy materials and pointing us to the right direction. The entire time we spent on the beach was dedicated to having as much fun in and out of the water. We swam, had a pictorial session, walked along the shore, transferred to a fresh water cove, and socialized with so many new faces. There were more than 40 participants in total. The next day, some went to the hidden falls and experienced the cool rushing waters of the untouched falls, chilly at times but still cool and relaxing. After all the last minute dips, we prepared to trek back to the other side, another looooong trek. Before we finished packing we were invited to take a boat ride to Subic instead. Some were more than eager to take the boat and see more of what Nagsasa Cove had to offer. The rest trekked patiently. Both ways had their own wonders. Those who took the boat ride were treated to some rocky waves and the refreshing sea breeze. It was a relaxing trip, most of the time. Those who chose to trek went to a nearby river to wash up. The water was so clear; it was easy to take pictures under water. By 7pm, both groups (boat and trek) met back at Chowking to prepare for the 3-hour ride home bringing back not just memories of a beautiful beach but also the wonderful experiences with new found friends. Days before the activity, we were all reminded to exercise before taking on the activities. (And NO, jumping up and down a trampoline is not exercise). Despite the numerous reminders, some were hard-headed. They ended up getting tired along the way, cramps and body aches coming out long before the climb even ended. Mt. Daguldol challenged our will power but we were stronger than we thought. Five hours after (under the rain) we were at the camp site, looking over the twinkling city lights of Batangas. As the darkness got deeper, the sky started to light up with millions of stars. We thought of how wonderful it would be to sleep under the stars but it was a a cold night so we all just slept in our tents and imagined the night sky from within. After a long night filled with drinks, stories, and dancing, the sun was coloring the sky in numerous shades of orange. The sun was already high up when we started our descent. Two hours later, the first batch was already at the Barangay Hall of Hugom. Two hours after that, we were all together again after a fast trek down and a long and hot walk along the Laiya coast line. The vans picked us up at the barangay and brought us to Laiya Cocogrove Camp where some cleaned up quickly. Almost half the group went home that afternoon but the other half stayed on for more adventures. Sunday dinner was great. We went to the near-by market and bought fish and pork for grilling, and drinks for a night of merry-making. After a sumptuous dinner, we pooled ourselves into a circle by the beach and enjoyed each others' company. Bel introduced us to a game called 7-up. the excitement of the game was reaching it's peak (lots of clothing and accessories already thrown into the center pile) when a lonely sea-turtle (pawikan) got onto the beach and started digging and laying eggs. It took a while to bury every egg and pack it so that no one would know where it was. Most were watching it as it took its time securing the eggs and then crawling back to the open sea. After that unforgettable action, some went straight to their tents while some resumed the nights' merry-making. Passed 9am the next day, some were still in their tents, sleeping. (The last people standing last night actually reached the sunrise hour.) While others were busy snoozing in the hammocks, some were at the zip-line area, zooming through the air while strapped to a harness, or paddling their way through the waves via kayaks. Some also went snorkeling at the nearby coral farms. Good thing we stayed at Cocogrove where so many activities were available (Thanks, Mr. Staley). Although most were planning to leave early, we eventually left late (before 4pm) because we were all having so much fun, we decided to just leave later and maximize our stay at the beach. Truly, it was an awesome 3-day weekend filled with so many adventures (and misadventures) that will be a part of many lunch stories to come. WOW! It was indeed a super weekend filled with so many adventures and memorable experiences. It all began that fateful morning of August 28. We all met at the Alps station in Alabang where a bus picked us up. Most of us slept during the quick travel to Batanggas Pier. The port men of the Batangas port were very organized and all the transactions that we made were done smoothly and quickly. Also, a ship manifest was made for our trip, unlike our other port experience where we were pushed to pray for our lives. Upon arriving at Puerto Galera, we unloaded the things we did not need for the climb (this made our bags much lighter!). Mr. Claudio, our NFF (new found friend) in Puerto was a very gracious host who kept our things safe for us. We then rode our hired jeep going to the jump off. At the jump off, true to stories heard from other climbers of Mt. Malasimbo, there was no formal guide system and the natives asked for thousands just to guide us up. We do not recommend asking the natives for assistance. The first hour up was hard. The path was steep and slippery. After about an hour and a half, the way became more friendly. All throughout the path, the view was spectacular. We could see the entire white beach area and the neighboring islands. It was a magnificent sight to see. The next day, most of us woke up early (5am) and waited for our guides who would help us reach the summit of Mt. Malasimbo. Unfortunately, our unreliable guides came more than 2 hours late. This made us decide not to climb to the summit anymore since it was also getting a bit gloomy. The already slippery path can become a lot more dangerous to go through if it rains. We used another trail going down and was picked up by the jeep we hired. It took us a while longer than expected because it was raining as we were descending. Despite the rain, we all enjoyed the trek down with all the slips and dips. At the beach, we quickly set camp and had lunch. A part of that afternoon was spent playing games. The wheelborrow relay was won by the middle group headed by Ram (the borrow driver) and Adel (the wheelborrow) while the Bury-Me-Alive game was won by Jing's group (with Tere buried halfway through). All the running and digging made everyone thirsty so we all enjoyed the prizes won (bottles of hard drinks, chips and dips, and chocolates). When evening came, we were all made full by the grilled fish and liempo prepared by our awesome chef, Dong. It was a tasty treat for our weary bodies. Socials that night was in full swing as the game of Callie was being played. We all tried to keep our focus as we played the creativity game while shooting on hard drinks. Hours passed midnight, we all called it a great night. Morning after, we all trooped to the snorkling spot several minutes away (by boat) from White Beach. There we were treated to a spectacular view of corals in various shapes and sized, fishes in so many colors, dark sea urchins, and a striped water snake. The waters of the snorkling spot were so clear, we could see the bottom of the deepest (50-foot deep) area. Hundreds of fishes would pool around our hands that held pieces of bread. Most nibbled on the bread while some nibbled on our hands. We were hesitant to leave but our time to go had come. Minutes later, we were back at the beach (camp site) packing our things for the long way home. We left the beach before 4pm and got into the way of the great afternoon waves. Some of the foreigners on board were getting scared of the waves but as we were nearing the port, the sea became calm. We debarked and walked towards our hired bus holding on to the great memories and adventures that Puerto Galera now held for us. There are so many mountains in Luzon alone that are in danger of being completely denuded already. This we learned through the brief discussion at the Makati office of CSR. We learned a lot about nature and how we can keep it from being completely destroyed. By 3pm, we were on our way to Quezon where the tree planting site is. There were around 40 of us tree planters who were eager to go out and hike then plant. The hotel where we stayed was a really nice place. It had a beautiful balcony where the view of the sunset and sunrise was a sight to remember. The food was also great! Yummy! That night we had a discussion on tree planting, and other things related to keeping the mountains alive. The next day, we had a big breakfast (to prepare us for the day's activities) then went on our way to the site. At the site, we were grouped and each group was assigned several armed men. The site was notorious for NPAs and other lawless people. Some of us were given the chance to carry their guns (they were really heavy). The trek to the plant site was hard. It was steep and the path went up and down. We finally reached the site and began planting. The armed men helped us to plant so we finished quite fast. Since it took us a while to reach the site, it was already hot when we were asked to trek back to the kubo where we started. Snacks were given to us, which helped us regain our energy a bit. We rode in the van and went back to the hotel. There we cleaned up, packed and things, and went on our way. For a while we were all noisy as we went along Quezon but less than an hour later, we were all fast asleep, with great memories in our hearts. Rain rain go away, come again another day... It was raining so hard until the day before the activity. Some were already hesitant to go but since the organizers (Bahaghari and White Mountains) had all contingency measures in place, we packed our bags and headed to Mt. Makiling. We were all glad we made it to the famed Maria Makiling's mountain. The first day was all about mud, mud, mud, and more mud as we sank our shoes and feet into the wet grounds of the path to Saimsim tree planting site. On our way we saw other trees that were planted years back. Some were already big while others were just a few feet tall. We planted as many as we could and went straight back to camp. The generous and gracious heads of the College of Forestry lent us their land and rest rooms so we were able to clean ourselves up and rest well. The next day, some of the mountaineers braved the limatik scare and went up to peak 2 while the rest went to the mud spring. Those who made it to the peak came back with memorable experiences courtesy of the famous limatiks. One even got bitten on the face more than 5 times. Others were bitten on the leg repeatedly. But all of them say that the first bite is scary but the rest just happen without fanfare. Those who went to the mudspring were told not to go passed the fence bordering the mud spring. Not long ago, a tourist fell into the 80-degree mud and died. The fence was placed to prevent any untoward incidents from happening again. With all the mud, the stroooooong winds, the broken tents, the limatik bites, the prizes won, and the many happy trees remains the scars of bites, the memories we keep forever, and the new friendships we have formed and strengthened. Hopefully, we'll be back next year! We have been climbing mountains and going through so many other adventures in the past months but since it was raining, we decided to take another kind of adventure - indoors. Wall climbing is fast becoming an indemand sport as well. Numerous walls are being put up around the metro where enthusiasts and even beginners can learn the ropes. It may look simple, just a rope, harness, and a belayer and you're on your way. But safety is a big factor so learing the proper techniques is necessary. The climber's life hangs by the thread!...so to say. There were more than 40 enthusiastic climbers who joined this activity, mostly beginners and first time climbers. We were not able to stretch much, some not at all, so we had a bit of pain hanging on the rope and pulling ourselves up through our hands while pushing with our feet. A few walls after, most were on the floor or on the benches, resting and trying to dry themselves up after a sweat-breaking activity. Most of the climbers never thought they were going to be able to climb a wall, but most were able to summit more than 3 walls, from beginner to intermediate, some even the advanced walls. We're glad it rained. We're glad we took another look at this indoor adventure that can also be taken outdoors. What we have learned in wall climbing can also help us when we face some rope sections along our climb paths. Thanks to the kind and supportive people of Power Up. A week before this activity, we were all doing our own versions of the "sun dance" because of the continuous rains. During the last weekend of training, 4 people backed out, mostly because of the weather. We were all anxiously waiting for the weather to improve. And yes it did! Monday started to be a little bit more sunny. Tuesday was a lot better, and when Wednesday came, the heat was on! Thursday evening, we all met at the Victory Liner bus station in Pasay (thanks to our friends there who helped us immensely). We got to Baguio, ate a bit and went straight to the Pulag National Park Office. We were met by Ms. Emerita, the park superintendent. All 32 of us sat at the visiting room and listened to Ms. Emmie's talk and watched the video on proper camp management and climbing rules. The video was different from the one of 2007 (last time we climbed Pulag). After the viewing, we met Teacher Maxima Onil, Capt. Anselmo, and other school personnel for the turn over of 10 boxes of school materials. We can't describe the joy we were seeing in the eyes of the recipients. They were overjoyed. After the ceremonial turn over, we were all off to Babadak (Ambangeg trail) Ranger Station. 32 climbers, 4 porters, and 3 guides later, we were on our way. The climb was gradual but because of lack of sleep and minimal food consumption, some took more than 4 hours to reach the camp site. Since we started early, we took our time. The weather cooperated with us. It was not too cold or damp, just right! We slept well, woke up at 330am, ate a bit of breakfast (soups and coffee) and started trekking to the top of Luzon. As we got closer and closer to the peak, we were slowly being greated by the sun rise. The view everywhere just kept getting better! When we reached the peak, the feeling was just overwhelming! The view of the many peaks around Pulag was clear as they rose above the vast expanse of clouds lying low until the end of the horizon. It was a sight to behold! We stayed there for quiet a while with the another mountaineering group tasked to raise the flag of the Philippines in coordination with the other 39 groups raising the flag in many other peaks around the archipelago. We raised our little flags as well and took turns having our wonderful pictures taken with the flags and the sea of clouds behind us. At the Ranger station again, we had a few trivia games where some cool and cute mountaineering prizes were won by two groups (1 and 2). Raffle items were also at stake for the rest of the climbers. It was truly a great activity where new friends were formed, friendships were strengthened, and a lot of great memories were formed. The school sponsorships, the peak, the clouds, and most importantly the people helped to make the great adventure and experience that is Pulag2009. It was a great afternoon, sun was up but it was windy. 6 mountaineers went up the cool mountain, Mt. Batulao in Batangas. It was a leisurely climb. The climbers, Jill, Roger R., Pia, Mark, Aris, and Dolly, took their time ascending and descneding the rolling mountain trails. They passed through the new trail and set camp at the new camp site. 5 of the climbers went up to the great peak and witnessed a beautiful sunset. They descended to the camp and had a good dinner. The next day, a visit to the Tagaytay Picnic Grove was made. Again, another beautiful view of Mt. Taal. It was a great afternoon filled with fun and learning. Tikboy and Pia were able to share their experience and knowledge of climbing. 23 participants from SPi and outside joined the learning session where demos were done to show how climbing should be done, from setting up a climb, packing a backpack, choosing shoes, cooking, to trail-sign reading. It was capped by a game where the participants were tested of their new knowledge. David Arellano topped the score sheets with a perfect 10/10 scoring, winning a brand new 1L Nalgene and 2 North Face stickers! Congrats, David! See you and everyone else at the next climb. We have been wanting to get to this ridge so many times but it never pushed through until this. Tarak Ridge is now know for its spectacular sea of clouds but that was what greeted us when we woke up on the second day. Wait...let's backtrack a bit to the night it all started. We were still sleepy from working the day before but we all met at the bus station in Pasay early in the morning and by 2am we were on our way to Bataan. We wanted to be there early so we could start trekking early. The sun was still no where in site when we arrived at the junction. We proceeded to register at the local baranggay office. One group was already there and a few more, they siad, had already started to climb. A few minutes later, other groups arrived. We did not want to rush and some of the climbers still did not have rice and other implements. We waited for the stores along the road to open then when we had what we needed, we went on our way. The first part had us go through a village. At the end, we turned left and there the trek began. Hours and hours later we were still on our way. The never ending trek seemed to take its toll on the climbers as one by one we started taking longer breaks. Thank goodness, we were blessed to have good weather and an early start. By lunch time, we were at the river already where we had a good lunch. We then proceeded to the hardest part of all. Three steps, rest... 5 steps, longer rest. The forested, stair-like path was unforgiving. The only good thing was that we were not under the sun. Hours after, one by one we emerged at the grassy area where a few more minutes of walking brought us to the ridge. It was around 4pm when we arrived at our destination. Others scouted the area to see if there was any other area worth exploring and camping at. In the end, we stayed at the ridge. That night, not many went to the socials activity. Most were so tired and worn out. The next morning, we were greeted by a wonderful sun rise and an even more beautiful sea of clouds just below the ridge. It was like a mini-Pulag view. People who normally kep their cameras suddenly had them at hand. Others who were known for sleeping through the sunrise were suddenly outside their tents, having their pictures taken. Rare sight, indeed! As we packed our things, we were reminded of the loooong trek going down. Along the way to the down-hill stair climb, we were greeted by so many other groups. It took us a while to get to the forested area again because of the many other climbers making their way down. But we are not really known for our speed so we took our time descending, making sure we were all safe at all times. Lunch was again at the river. We stayed there for a longer time compared to the day before. Some took a bath in the clear waters while some just hanged around the flowing river. The rest of the trip down was done a bit faster since most were already refreshed by the cool waters of the river. We were taking so much time but, again, we were early. We got to the main road before the sun finally said good-bye and there we also bit Tarak Ridge our farewell and see you again! A few years back, SPiMC had a tree planting activity at the La Mesa Water Shed. It has been a while since the club has initiated a tree planting activity so we braved the rains and went to one of the remaining water sheds in Metro Manila. 186 employees and friends joined this fun over night activity. 2 buses, 2 vans, and numerous walk-ins later, we were off to a great adventure. The caretakers of the site were very gracious as they dug holes on the ground where we were to plant the trees. We were given 200 trees to plant but we planted more than double that, as we were told. It was a really fun activity and became even more exciting when we visited the Eco-Park the next day. At the Eco-Park, we had some games, went boating, and some even dared to ride through the Zip-Line. The rain damped our spirits for a few moments but it wasn't able to ruin the spirit of the entire group. Up and up and up until we get to the peak then we go down again to get to another peak. That is what we wanted to do but we were not able to reach the other peak. But despite having summited only one peak, it was a great climb. So many adventures and misadventures. Brian, from batch Echo, was the key person in this climb. He was climbing up a rock too close to another climber. A rock fell on his head and caused a deep wound. The first aid knowledge of some climbers helped to quickly remedy the situation. Truly it exercised the BMC knowledge of the group. Mt. Arayat is situated in a national park where most do not climb but swim in the hot springs instead. We did trek up for 6 hours or so with the hot springs at the back of our mind. That night, we rested our bodies after a great meal. The next day was devoted to swimming! We went without knowing what we were getting into. Balingkilat is not for the faint hearted. When we climbed up last June, 2007, we were the 3rd group to ever climb this new climb destination. Being a new mountain, not many new the path and we were constrained to stick with the group guiding us. It was the hottest day ever, the heat burning every inch of our desire to reach the designated camp site. The lack of trees along the trail made it extremely difficult to push forward. We were literally running along with the shadows made by the clouds and also the trees sparsely dotting the trail. It became difficult enough that we would motivate ourselved by making each tree we saw in the distance a goal. Baby steps, small successes. It took the last person almost 12 hours to reach the camp site. It was a gruelling day indeed but we did not set-up camp elsewhere but in the designated area. After dinner, most climbers quickly disappeared into their tents, waiting for the various aches in their body to catch them as they sleep. Some chose to drink the night away and play a few games. The new day was welcomed by a spectacular sunrise and one of the most majestic views ever. The view clearly melted away any pain brought about by the activities of the day before. If the ascent deserves a much longer piece, the descent was just as eventful. So many got knee problems along the way and had to be assisted going down. Hours and hours of walking made the climbers tired, water was running short and it was again a very hot day! How we got down in one piece is a puzzling thing. Upon getting a few kilometers away from the mountain, most promised never to climb Balingkilat again. Was the view worth all the trouble? Yes it is so we really took so many pictures of it. This goes to show how important it is to assess the climb first, always be prepared for the worse and never to underestimate the mountain. So many lessons learned. We bring them to our adventures. In November of 2007, mountaineers from both the Manila and Laguna sites explored Mt. Pulag via two trails, Ambangeg and the killer Akiki route. Until the moment, the sea of clouds is still vivid in my head. The very early morning summit assault was very much worth it! This year, 2009, another set will aim to reach the top. (See calendar for details.) This time it will be mixed with an outreach activity. THis year, the climb is dubbed: "Mt. Pulag - Climb for Education." It was a really fulfilling tour as more than 50 employees got to visit the various tourist spots of Banaue, Sagada, and Baguio. Employees from the Manila and Laguna sites joined in and experience one of the Philipine-Heritage sites and also one of the Wonders of the World. Though we camped out in the cold while some slept in hospital beds, we truly enjoyed moving around the area. From shopping, to strolling in the park, to spelunking, and trekking, we did it all. Most of the activities were challenging but everyone was up to them. Everyone truly survived the challenges, especially Sumaging cave (Sagada) and Big Falls (Sagada). Another tour was set up in 2009, participated by 49 employees and their friends. It was another successful 3-day adventure worth another trip in the future. Thank goodness, after several hours we were on our way to one of the greatest adventures of all. We started of at Mt. Malindig. Little did we know that the peak is off-limits to climbers without permits from Camp Crame. Hmmm... I guess it was all for safety reasons. Peak or no peak, it was a great climb none-the-less... The next day we went into the various caves of Marinduque then went to the famed Molbog Sulfur pools. Smelled really bad but it was worth the dip! The next day we went to join the Moriones festival and bought souvenirs at the fair. That night, we stayed at a school (Thank you so much to our very gracious hosts) and was brought around the festival by hired tricycles. The day after, we went to one of the most beautiful beaches I have ever seen. The Tres Reyes Islands were a sight to behold! Clear waters, great company, yummy food, and a starfish on the shore. WOW!!! Tons of great pictures, hundreds of cool memories were brought home to Manila via another difficult time at the port with still unorganized portsmen manning the bus station. That summer in 2008 brought so many new people into the group. The club decided to go far from Manila and visit the famous Anawangin beach. Instead of riding a boat to get there, we went up Mt. Pundaquit. The climb up was a bit difficult since no clear trail could be seen. We just went up and up... Once the river was visible, and the sand was in sight, a few minutes after a breathtaking view greeted us. WOW! THe beach is prestine! Clean, clear, and shallow, and the surrounding area is just a sight to behold! Besides enjoying the view, the exercise, the food, and company, mountaineers also find it fulfilling to engage in another kind of climb called the outreach climb. 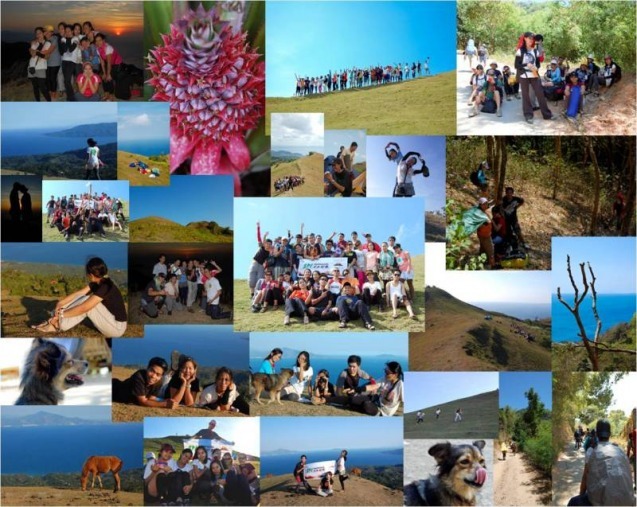 One of the batches of MFPI organized a great climb-for-a-cause with a school and community in Kanawan as beneficiaries. So many eager hands went up Zambales to bring school supplies, food, and construction materials for a commonal rest room. The day we got to Kanawan was a really hot day. As we went up the path, we were all running for the shade, our every step on the steep path geared toward reaching a shaded portion of the trail. At Kanawan, we turned over the school materials, had a learning session on nature preservation, built a rest room, interacted with the community, and went to the beautiful Kanawan Falls. We achieved much that weekend, made so many hearts happy. That is truly what climbs should be for! This MFPI project, and that of AMCI's BBBS, has inspired the club to engage in our own activities for a cause.